Re-blogging from Shades of Umbria, 5 May 2014. This is the 19th in a series of posts on the ethics of competition, focusing on Castel Rigone Calcio, and part of the ‘Ethics of Combat‘ category on quemdixerechaos. This blog series completes a DePauw University Faculty Fellowship that examines how and why rules and customs develop for, and in, combat and competition. 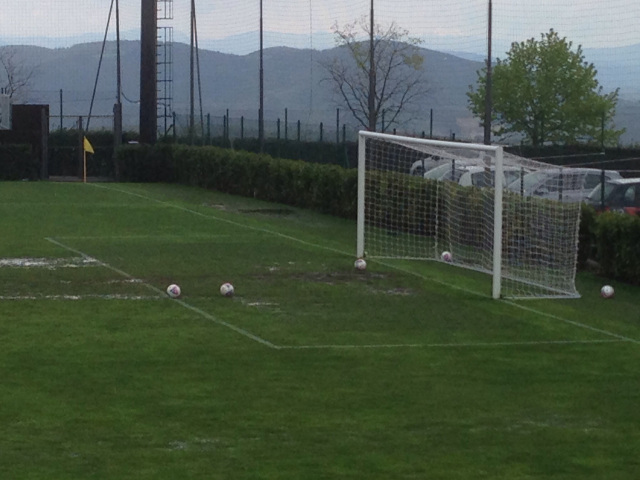 This past Sunday, May 4th at 15:00, at Stadio San Bartolomeo, Castel Rigone played their last match as a team in the professional division of Lega Pro (soon to become ‘Serie C’ again). They lost 2-0, their seventh setback in a row. They had already been relegated the previous week. I wasn’t there to watch. Re-blogging from Shades of Umbria, 19 Apr. 2014. This is the 18th in a series of posts on the ethics of competition, focusing on Castel Rigone Calcio, and part of the ‘Ethics of Combat‘ category on quemdixerechaos. This blog series completes a DePauw University Faculty Fellowship that examines how and why rules and customs develop for, and in, combat and competition. The Binchester excavation project is currently seeking enthusiastic excavators to join our team for the 2014 season and help excavate a Roman fort and expansive town near Durham in the UK. Known to the Romans as Vinovium (“On the Wine Road”), Binchester protected Dere Street, the main road that ran from the legionary headquarters at York northwards to Hadrian’s Wall. It was a key element of the complex frontier system that lay on both sides of the Wall, forming the edge of empire for nearly four hundred years. Previous excavation has so far uncovered the best preserved Roman bath house in the UK and some of the most impressive mausolea seen on a Roman site for 150 years. Geophysical survey has revealed a large town that stayed thriving long after the empire fell. Across the river at Escomb is one of the oldest churches in Britain, built from the stones of Binchester in the 7th century, still standing as a reminder of the kingdom of Anglo-Saxon Northumbria, the heartland of Celtic Christianity and land of Arthurian romance. The project represents an international partnership between scholars at Stanford University (USA) and Durham University (UK). Volunteers will spend 4 weeks excavating, processing artifacts, and visiting key archaeological sites in this area of the Hadrian’s Wall frontier zone. The cost of $ 4,500 (USD) covers housing in the medieval town of Durham, all meals, archaeological instruction, and weekend field trips to Roman and Medieval archaeological sites, including several along Hadrian’s Wall. Flights and travel to Durham are not included. Academic accreditation is possible (see our website).